In the 1960s and 70s, my parents told me to brush my teeth after eating candy. It was all about cavities. Too little was known then about all the chronic diseases driven by sugar long after the brushing. Children’s TV ads were exploding with sugar, cultivating a generation of loyal users. Today, we eat more sugar and refined carbs than the body can handle. We’re being played by the food industry, and our kids are too. I was surprised to learn of all the damage sugar causes as it travels through the body. Unfortunately, we need more than a toothbrush to protect ourselves from the harmful effects of sugar. Diabetes By the time our kids are our age (2050), one-third of Americans will have diabetes (CDC, 2010). Even 40 percent of thin people are pre-diabetic (FED UP film, 2014). Cancer Cancer loves sugar; sugar feeds the growth of tumors’ blood vessels. Cancer is the leading cause of death by disease in children under fifteen (CDC). Cancer rates have risen from 1-in-20 (early 1900s)…to 1-in-16 (1940s)…to 1-in-10 (1970s)…to 1-in-3 (Today) (http://articles.mercola.com/sites/articles/archive/2014/02/27/cancer-rates-rising.aspx). Heart Disease & Stroke Sugar corrodes LDL cholesterol’s walls, spilling oxidized fat into blood vessels. 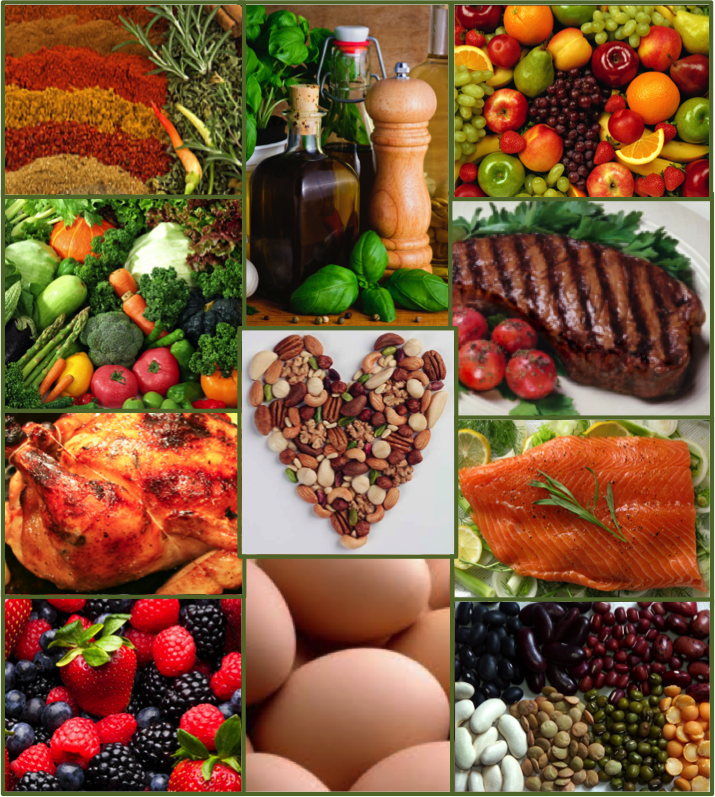 Free radicals then scorch, tear, and inflame blood vessels, arteries and cell membranes leading to heart disease and stroke (see Good Fat Bad Fat in Reflections, Summer 2015, http://www.colokitchen.com/reflections-mag-summer-15). Liver Disease Today, fructose surpasses alcohol as the major source of liver disease. Up to 35 percent of American adults now have fatty liver, reducing liver function and leading to cirrhosis. Autoimmune, Lyme, Candida Sugar feeds unfriendly microorganisms in our G.I. tract, leading to Leaky Gut and autoimmune disease (see Nourishing the Roots of Our Tree in Reflections, Spring 2015, http://www.colokitchen.com/reflections-mag-spring-15). Sugar then travels through the blood stream, feeding Lyme, Candida, and other chronic infections. Reflux, Heartburn, Ulcers Sugar breaks down our communication systems, decreasing stomach acid production. Surprisingly, too little stomach acid causes reflux and heartburn more often than too much stomach acid. Low stomach acid also invites food poisoning and nasty bacteria like H. Pylori, which burrow into the stomach lining to cause ulcers. Adrenals, Hypoglycemia, Hormones The adrenal glands, responding to chronic stress and blood sugar extremes, can burn out, leading to hypoglycemia, seizures, depression, headaches, and chronic fatigue. Hormonal balance gets lost, resulting in menopausal symptoms, infertility, ED, thyroid issues, hair loss, weight gain, digestive issues, and hyperactivity. Infection, Cell Blocking, Organ Damage Like a wet lollipop sticking to fingers, sugar “gunks up” white blood cell receptors, inhibiting infection-fighting for up to 48 hours after consumption; nutrient channels get clogged; and hormone communication gets blocked (Deep Nutrition, by Dr. Catherine Shanahan). Cells and tissues become stiff and brittle, creating cataracts, joint pain, asthma, and skin issues. Brain In Grain Brain, David Perlmutter, MD, discusses brain inflammation due to sugar and excess carbs: depression, anxiety, ADHD, chronic headaches, and Alzheimers. As of 2011-2012, 11 percent of U.S. children had been diagnosed with ADHD, over two-thirds of them taking ADHD medication (http://www.cdc.gov/media/dpk/2013/dpk-ADHD-estimates-rise.html). 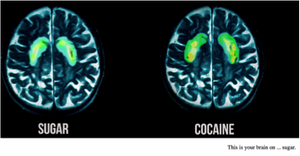 Yet we’re told the average American teen eats 28 teaspoons per day. I measured this out, wondering what 28 teaspoons looks like (almost 2/3 cup!) and questioning if it’s an exaggeration. This comes to 26-59 teaspoons on a typical day, far exceeding the recommended 5-8 teaspoons. Undoubtedly some teens consume less, but a national average of 28 teaspoons seems realistic. We began overdosing around 1977, when manufacturers re-engineered their processed foods to remove fat, and compensated with added sugar. 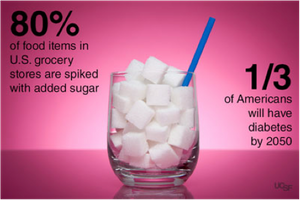 Hidden Sugar 80 percent of processed foods are spiked with added sugar (FED UP). A Dannon vanilla yogurt contains the same amount of sugar as two Twinkies. There are roughly 100 names for sugar (Common Sources and Names of Hidden Sugars, http://www.colokitchen.com/HawthornSugarDocs-1.pdf). Refined Carbs and Fiber We’re told to eat more grains and fiber, yet breads, cereals, crackers, baked goods, pastas, pizza, white rice, and corn products are like sugar injections, rapidly converting in our bloodstream. Wheat Belly author Dr. William Davis says two slices of whole wheat bread raises blood sugar more than two tablespoons of sugar. Better fiber is better found in the produce department. Food advertising, merchandising and celebrity endorsements hijack our brains. Dora the Explorer lures kids in, and we can’t purchase linens without a sugar assault at checkout. 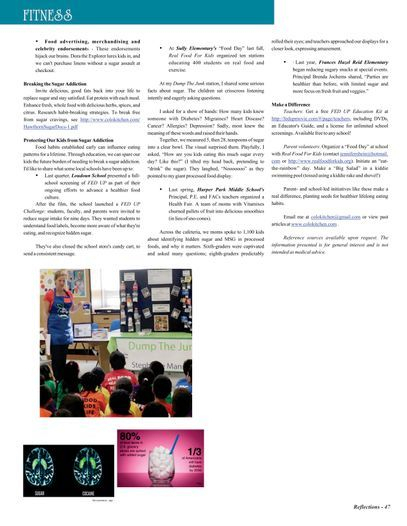 Last quarter, Loudoun School presented a full-school screening of FED UP as part of their ongoing efforts to advance a healthier food culture. After the film, the school launched a FED UP Challenge: students, faculty, and parents were invited to reduce sugar intake for nine days. They wanted students to understand food labels, become more aware of what they're eating, and recognize hidden sugar. They’ve also closed the school store’s candy cart, to send a consistent message. At Sully Elementary’s “Food Day” last fall, Real Food For Kids organized ten stations educating 400 students on real food and exercise. At my Dump The Junk station, I shared some serious facts about sugar. The children sat criss-cross-apple-sauce, listening intently and eagerly asking questions. I asked for a show of hands: How many kids knew someone with Diabetes? Migraines? Heart Disease? Cancer? Allergies? Depression? Sadly, most knew the meaning of these words and raised their hands. Together, we measured 5, then 28, teaspoons of sugar into a clear bowl. The visual surprised them. Playfully, I asked, “How are you kids eating this much sugar every day? Like this?” (I tilted my head back, pretending to “drink” the sugar). They laughed, “Nooooooo” as they pointed to my giant processed food display. Last spring, Harper Park Middle School’s Principal, P.E. and FACs teachers organized a Health Fair. A team of moms with Vitamixes churned pallets of fruit into delicious smoothies (in lieu of sno-cones). 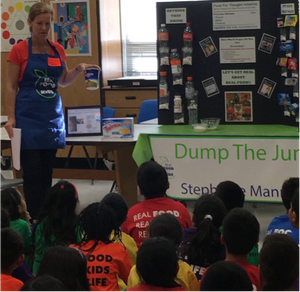 Across the cafeteria, we moms spoke to 1,100 kids about identifying hidden sugar and MSG in processed foods, and why it matters. Sixth-graders were captivated and asked many questions; eighth-graders predictably rolled their eyes; and teachers approached our displays for a closer look, expressing amazement. Teachers: Get a free FED UP Education Kit at http://fedupmovie.com/#/page/teachers, including DVDs, an Educator’s Guide, and a license for unlimited school screenings. Available free to any school! Parent- and school-led initiatives like these make a real difference, planting seeds for healthier lifelong eating habits. 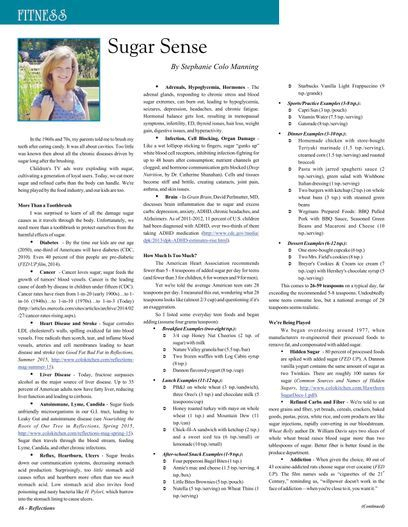 Email me at colokitchen@gmail.com or view past articles at www.colokitchen.com .